Boston-bred, Yonkers based Ellen Kempner, a.k.a. 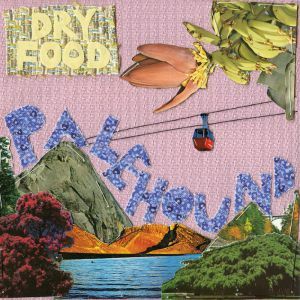 Palehound, comes crashing out of the gates on Dry Food with the one-two punch of the guitar chugging “Molly” and the off-kilter earworm “Healthier Folk.” “Too stoned to take an antibiotic/‘cause I feel my infections wrestle in my bones” is “Folk”s attention-getting opening line, but it’s the guitar overdrive at 1:20 that elevates the proceedings to another level. Following up her 2013 debut EP Bent Nail and last year’s Kitchen 7″, she has consolidated and flung everything into a compelling full-length. The imagery is arresting: ”Pushing back your tongue, with my clench-teethed home security system” from “Easy” scars the brain. Taking a breath after the opening salvos, “Cinnamon” conjures up an effortless groove worthy of the late, lamented Spectrals. At her best, Kempner stirs up startling home truths on the fever-dreamy title track: “You made beauty a monster to me… so I’m kissing all the ugly things I see.” “Dixie” manages the greatest immortalization of the Dixie Cup since Katie Crutchfield. Soft or loud, the intensity never diminishes, and “Cushioned Caging” ramps it back up for the grand finale of “See Konk.”. By taking the painfully internal and shining a light on it, with Palehound, Ellen Kempner has come up with this generation’s Exile in Guyville.